For years, Island Explorer vehicles have been giving passengers free rides to Acadia National Park and Mount Desert Island. Though providing this service cut back on traffic congestion and vehicle emissions, and improved the overall experience at the park, the buses did not actually have a home and sat instead in a parking lot. 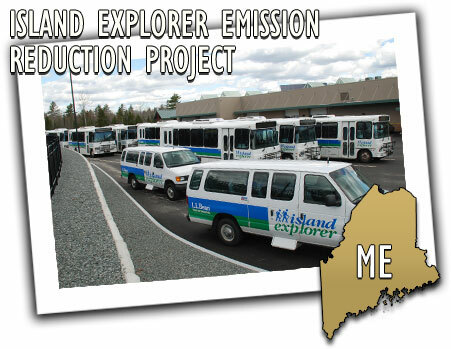 In order to continue providing the transportation service to the public, MaineDOT decided to create a facility to house the fleet of 30 or so environmentally-friendly propane-powered buses. Named the Acadia Gateway Administrative and Maintenance Facility, the $14.7 million project was funded through multiple federal and state sources, $11.6 million of which came from the Federal Transit Administration. While the planning for the facility began in the late 1990s, it wasn't until 2010 MaineDOT was able to break ground. Supporters of the project credit the partnership between roughly 20 public and private agencies as the reason for the quick completion and ease of construction. MaineDOT worked closely with FTA, the U.S. Department of Transportation, and the National Park Service to keep the facility on track. MaineDOT held a ribbon cutting for the Acadia Gateway Administrative and Maintenance Facility on Friday, May 4, celebrating the completion of the first phase of the project. "From the initial design phase, to the contractor's efforts in building this state of the art facility, to the people who will enjoy what this opportunity has to offer, I am excited to help ease the area's traffic congestion and make this experience more environmentally friendly for generations to come," said MaineDOT Chief Engineer Kenneth Sweeney in a statement. MaineDOT has begun planning the next phases of the project, which include a welcome center and an intermodal facility. But with the Acadia Gateway Facility now open, park visitors will be able to enjoy seamless transportation at the park knowing that they are doing so in an environmentally responsible way.